A new survey was released this week showing that just 66% of businesses are advertising online. At the same time, 89% of consumers, the survey from The Manifest says, are online. It sounds like a lot of businesses are missing the mark. After all, they should be advertising where consumers are most, right? My guest for This Week in Small Business this week disagrees. Jeff Brathwaite says businesses may not be paying for advertising online but that doesn’t mean they’re not promoting. Check out our whole discussion on this subject as we dissect this and my other favorite articles from Small Business Trends this week. To get updates when future episodes of This Week in Small Business go live, be sure to subscribe to the Small Business Trends YouTube channel today. Don’t miss the rest of the week in small business news in our news roundup below. 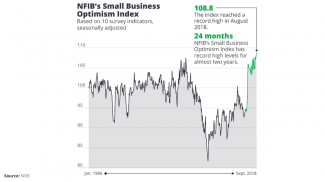 Optimism is high among small business owners, with revenue and staff growth on the mind of many in the U.S. This was one of the findings of TD Bank’s annual Small Business Survey, which found 53% of small businesses planned to grow in 2018, up from 46% in 2017. The number of small business owners planning to recruit more staff increased from 9% to 22% in the same year. The record low unemployment rate and the tight job market are making small businesses reassess many of their hiring practices. According to ZipRecruiter, this includes providing more details in their job descriptions for help wanted ads. ZipRecruiter analyzed the data for 4.5 million posts from early 2016 to 2018 to figure out how the rate of unemployment affected job descriptions. Today, good business is about more than great products, services, and outstanding customer care. It’s about learning how to navigate through all the new and fast moving risks to your brand. Small Business Trends spoke with Fortune 500 Chief Marketing Officer Peter Horst MBA about these potential marketing bombshells in what’s been refereed to as the Trump Era for business. In a move to simplify process automation, Quick Base has just announced it is bringing Kanban Reports to its no-code development platform. By integrating the Kanban system into the Quick Base platform, the company looks to give business professionals the ability to manage processes and projects more effectively across teams and the entire organization. On August 16, Slack experienced connectivity issues in the middle of the working day, with certain features not working. The messaging app services was down for some time until Slack resolved the problem. Slack’s outage followed similar software outage failures this year. Running your own small business is rewarding, but it comes with many challenges. A new survey commissioned by Progressive Insurance looks at the role gender and age play in this segment, revealing some distinct differences. The survey revealed men are more financially secure about running a small business, by a 14% margin of 84% to 70%. If your small business is located in Atlanta, Orlando or Denver, beware! A new report has identified these cities as the top three with the highest malware infection in the US during the first six months of 2018. Logitech (NASDAQ: LOGI) has released a new ergonomic mouse intended for small business owners and others who spend a lot of time in front of the computer. The MX Vertical is scientifically designed to reduce forearm strain and wrist pressure without compromising on performance. Microsoft (NASDAQ: MSFT) has announced it will be ending support for Windows 8.1 and now it has done the same for new apps in the Microsoft Store. Microsoft first announced plans to end support for Windows Phone’s operating system back in July 2017 so users — including small businesses — have had some warning. The platforms in question are for Windows Phone 8. If you fall victim to a cyber-attack in the United States, do you know each state has different laws when it comes to a data breach? The Definitive Guide to US State Data Breach Laws from Digital Guardian is a comprehensive report of what you can expect from all 50 states, the District of Columbia, Guam, Puerto Rico and the US Virgin Islands in the event of a cyber-attack. There’s a new AI tool for small business that automates chatbots and blends that innovation together with machine learning to help employees and customers find the updated information they need quickly. Boston-based Talla recently released it’s Intelligent Knowledge Base 2.0. When it comes to cybersecurity, many businesses aren’t as prepared as they should be. A survey conducted by Gartner (NYSE: IT) revealed although 95% of CIOs expect cyber threats to increase in the coming years, only 65% have a cybersecurity expert on staff.